With no ferry operating in the foreseeable future, J&E looked worried. How would we get home? 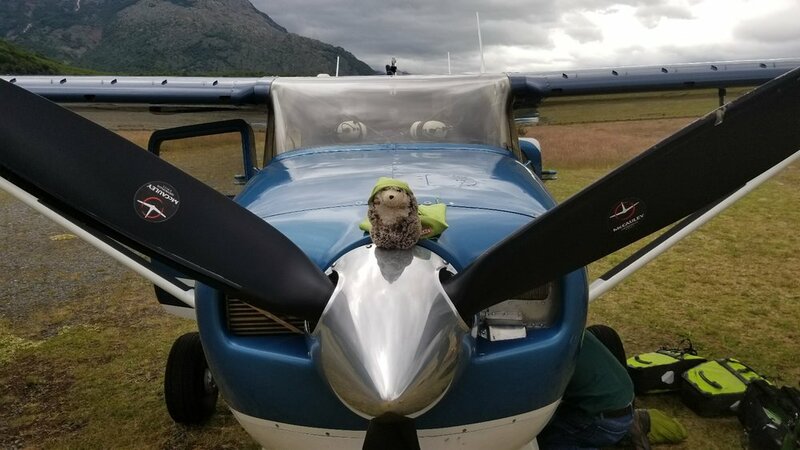 After chatting for a while with the woman who helped make reservations for the boat, we learned that there was an airplane in town that might be able to get us across the lake. Vincent and his blue Cessna 206 to the rescue! Vincent (a US ex-pat originally from California) lived just across the street and operated a small charter plane business with his buddy Daniel. He was chatty, had done work with glaciologist friends of Erin's (both from Chile and the US) and said that that weather looked like we might be able to fly to the border that night, or the next morning, or the following morning. But the weather was getting worse, so we'd likely have to leave early in the day if we were going to be able to land in the small valley across the lake. E&J opted to go the following morning at 7AM if the weather cooperated. And it did. For an extra $25, Vince said he'd fly us over the glacier. E was very happy to see the glacier from above. I thought it was pretty cool too! (get that - 'cool'? ha ha). l got to ride up front with J. And we landed safe and sound - no big hops, no skidding out. Phew! Here's the runway from a Hedgehog's perspective. Bigger landing strip than I had thought it would be. E&J were so so relieved to have had made it across the lake and almost to the border of Argentina that they immediately found a gravelly sandbar and took a nap. They were pretty tired after three days of hard riding (one 60 km an two 80+ km days of riding on gravelly, washboardy road was a lot for them). After their nap, they headed for the border, just a few kms away. Once we entered Argetina, the road turned to a muddy path and the going got tough. E&J pushed their bikes along the 'mostly rideable singletrack' (so they were told). MUD with a capital M.
I wasn't sure what we were getting ourselves into. 6 more kms of this? UGH!